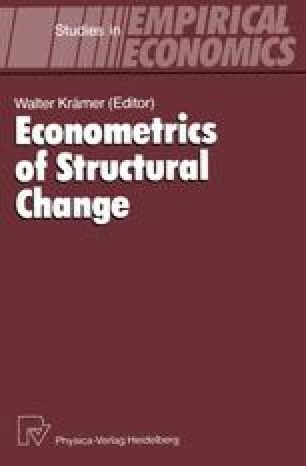 The typical “structural change” situation is — from the point of view of a statistician — as follows: To cope with a particular economic phenomenon a model is specified, and it is suspected that for different periods of time, or for different spatial regions, different sets of parameter values are needed in order to describe the reality adequately; the “change point” which separates these periods, or regions, is unknown. Questions that arise in this context include: Is it necessary to assume that the parameters are changing? When, or where, does a change occur or — if it takes place over a certain period of time — what is its onset and duration? How much do parameters before and after the change differ? What type of model is appropriate in a particular situation (e.g., two-phase regression, stochastic parameter models)? in 1988/89 Visiting Professor at the Department of Statistics and Actuarial Science, The University of Iowa, Iowa City, USA.